A well known Chilean historiographer called Julio Retamal, Director of the Faculty of History of the Catholic University of Chile made an investigation of the origin of the founder families of this country. The first families of Greek origin who came to this country were presumably from the island of Crete and their descendants are still named Candia, although they did not know their Greek ancestry till Retamal¨s discovery. And this is because we are speaking about the sixteenth century. But if we refer ourselves to the Greeks who came to Chile during the nineteenth century (which were a few) and specially to those who came and established themselves in the past century we have to transfer ourselves to a city-port called Antofagasta. Nowadays we are speaking of a town of 350.000 residents which is well known in the trading world because from there the Chilean copper is exported to many important industrial centers of the world. And at that northern city of Chile arrived most of the Greeks that came to Chile in the early twenties but not for the exploitation of copper but because of the nitrate. This location, all the deserted area from Chile which included the cities of Iquique and Antofagasta and lots of small settlements in the interior of those, started to become like California in the golden era. Immigrants from all parts of Europe and North America came to exploit the nitrate. The Greeks, of course, because of their adventurous spirit, the first World War and the Catastrophe of Asia Minor, also heard about this new flourishing world and came to Northern Chile to seek the luxury that the nitrate was generating in that area. There was a period in which Chile was so rich that no taxes were paid in the country. This period lasted when the synthetic nitrate was invented. The only information we have nowadays of the first Greeks that came to Chile, and specially for those who came to Antofagasta, are part of a legacy that belongs tocted and published in a book called "Grecia y los Griegos" in "El Mercurio" de A the most important newspaper of the city of Antofagasta called "El Mercurio", which was collentofagasta by the son of a Greek, Miguel Politis Jaramis. Politis reconstructed the history of the first Greeks from the archives from "El Mercurio" because the most valuable chronicles were burnt in a fire that destroyed the house that was known as "Colectividad Helénica de Antofagasta" in 1946 when the building and archives were completely destroyed. But let’s then go to the first information related to the Greeks in Chile. that appeared in the Chilean press. 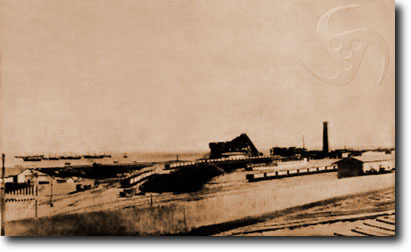 Between the years 1920 and 1935, there where 400 Greeks living in Antofagasta and in the interior of that region where the numerous settlements of nitrate existed. In the newspaper "El Mercurio" appeared the first information related to those Greek adventurers". Juan Satirakis, the Greek Consul General in Santiago traveled to the city of Antofagasta to suggest to Ramón Chilovitis (who afterwards became the secretary general of the debuting community) that the Greeks in that city should collect funds to organize the Greek community of Antofagasta. Satirakis was the one who gave the first amount of money for the future community. So on September 20, an association was founded called "Sociedad Helénica de Socorros Mutuos" (Hellenic Community of Mutual Help) with 147 associates. The first directors were Geraldo Triantafilos (president), Jorge Katevas (vice-president), Ramón Chilovitis (secretary), Stilianós Balabanos (pro-secretary), Jorge Karayanis (treasurer), José Sclabos (pro-treasurer), and the counselors were Teodoro Jaramis, Jorge Galanakis, Menelao Franciskakis, Gerardo Kasaneva and Angel Adamopoulos. Some years later, in 1926, the first association of Greek ladies was created named "Filóptoxos" and the first President was my grandmother, Xrisí Almallotis. From that time till now the Greek Community in Antofagasta still survives in its almost fifth generation although most of the original Greek families moved to Santiago and Valparaíso. There must be some seven people in the present community of Antofagasta that were born in Greece and, of course, speak the language. The amazing thing is that Antofagasta has one of the most patriotic communities in Latin America although almost none of them speaks the language and 95% are married to Chileans but they still maintain the traditions and they still feel Greek. A couple of weeks ago, the Orthodox Archbishop of Buenos Aires Tarasios organized a gathering with young people of Latin America in Iguazu, Paraguay, and the group of youngsters from Antofagasta obtained the first place for their costumes and dancing. Many people in Latin America asked themselves whether Antofagasta can be a model community in our continent although there is no church, no millionaires, no school, no Greek language. Maybe the answer is that they had always good consuls and this means good leadership. The Greek consuls in Antofagasta were always very active and efficient, till today. And they do it pro bono because they are not paid by the Greek government. The lady who is the Greek consul now is Ketty Farandato. She was born in Antofagasta and her father was from the island of Kefaloniá. Ketty speaks and writes Greek, English, French, German and Spanish. She is an English teacher at the University of Antofagasta and writes for the newspaper "El Mercurio" of Antofagasta. She is one of the most outstanding figures of the city for her knowledge, culture and personality. When the city of Antofagasta celebrates the town anniversary on the 14th of February, all the foreign communities present a stand. The Greek one is always one the best. I happened to be in that city last summer (almost a year ago) and was surprised by the beauty of the construction painted with the colours of the Greek flag. The young girls of the Hellenic community were selling Greek pastries (baclavades, kourabiedes, melomakarona, zaraglí, halvá, galaktobouriko, finikia, koulourakia, loukoumades, etc) dressed in Greek gowns and the boys played very good bouzouki music, interpreting Greek music. I can swear to you that I had a very strange feeling in my heart when I thought that almost after a century, those young Greek descendants from a fourth or fifth generation still feel so Greek in a place so far away from their motherland, in the midst of the driest desert of the world. And Hellenism is still alive! Unbelievable!